In the next few days, you’ll hear a lot more about my Spin Tunes experience and how the Gatecrasher album is going, so I figured a bit of light video game related stuff for today. Rock Band has “Are You Gonna Go My Way”, “Let Love Rule”, “Mr. Cab Driver” and “Freedom Train”. Sure, “Are You Gonna…” is the big hit (despite it being boring as hell to play in the game) but there’s some great musicianship found on “Always on the Run”. C’mon, it’s got Slash of Guns & Roses/ Velvet Revolver on guitar and a drum part that Steven Adler couldn’t play (which is why it didn’t end up a G’n’R song). I’d love to play this song. Huh? Rock Band has no Cream? I don’t know what the rules of exclusivity are when it comes to these games but this lack of Eric Clapton is a damn shame. I have a lot of appreciation for his playing ability. There were many MTV Unpluggeds back in the day in which the guitarist proved that they were great with the electric but lacked the chops to handle a good acoustic. Clapton showed he’s got the acumen in spades. This is probably an exclusivity issue since Slash has been involved with the Guitar Hero games but Rock Band has an entire G’n’R album. Granted, it’s Chinese Democracy but still. There’s gotta be some way to get this classic into Rock Band. And now that Rock Band has the pro-mode where you can play a real guitar, this song would be perfect. Growing up, the opening riff was an essential for young shredders to learn. (Note- I wasn’t one of those young shredders. Chords are my thing). Rock Band trumps GH by having all the songs of Nevermind for playing, but it would be nice to have some songs from the In Utero album too. And GH has “Heart Shaped Box”. Since I’m already talking about Nirvana songs, GH also has “You Know You’re Right”. I’d love to play that too. 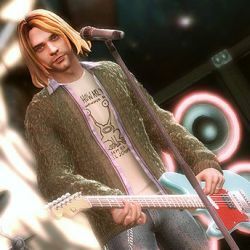 Courtney Love is upset with GH, calling putting him into Guitar Hero 5 as a playable character “necrophilic”, and Dave Grohl loves Rock Band (as shown by the ridiculous amount of playable Foo Fighters tunes); perhaps Love & Grohl can send more Nirvana songs to RB. Maybe? Please? If you were to ever hear my first ever musical recordings, you could hear the large amount of Smashing Pumpkins influence. I have been a big fan of them for years and Teargarden by Kaleidyscope is slowly rebuilding my interest. “Cherub Rock”, “Siva”, “Zero” and “Today” have all been fun to play in the game. It would be great to have even more SP songs like the one GH has. There were many rumors of the song coming via RBN, make it happen! Simply, this is one of my all time favorite songs. Maynard James Keenan seems to have shown a preference to GH as there are 3 Tool songs and 1 APC song there to a disappointing zero on RB. He also appeared at E3 to help promote the new GH game, the one with the fantasy story-line quest mode about saving some Demigod of Rock. I don’t need all those crazy bells and whistles. I just wanna play the damn song. I have played “PDA” by Interpol about 1000 times in Rock Band and every time I have said to myself, “That was fun but I wish I had “Evil” or “The Heinrich Manuever” or “Obstacle 1″. That would rock”. You should’ve seen my face when I learned that “Obstacle 1” was in GH. It wasn’t enough to make me wanna play the GH game (I just don’t enjoy it as much) but “Obstacle 1” is the song from the GH catalog that I want the most on RB. This entry was posted on September 8, 2010 at 3:25 pm and is filed under 10 Shards with tags Guitar Hero, Music, Rock Band. You can follow any responses to this entry through the RSS 2.0 feed. You can leave a response, or trackback from your own site.